November 14, 2018 – Dayco, a global leader in the research, design, manufacturing and distribution of essential engine products, drive systems and services for automobiles, trucks, construction, agriculture and industry, has again been recognised for its innovative ACTIVAC™ vacuum generation system for brake vacuum assist utilized in the Ford F-150, Lincoln Navigator and Nautilus, and other vehicles. 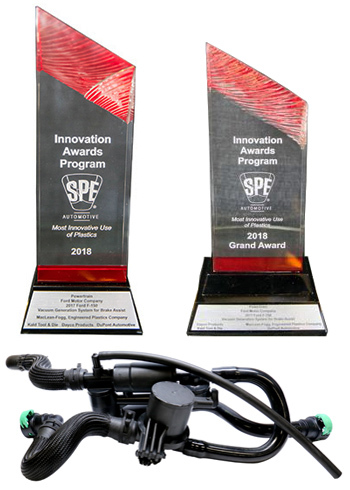 This latest success came from the Society of Plastics Engineers at its 48th annual Automotive Innovation Awards Gala, where Ford, Dayco, MacLean-Fogg and DowDupont took the top honor in the powertrain category as well as the Grand Award for innovation in plastics. Today’s forced induction engines cannot supply the necessary vacuum required for brake assist. This fact, combined with the need for improved fuel economy, decreased emissions and improved performance, drove the need for a fresh approach. Dayco responded to the challenge with its ACTIVAC™ vacuum generation system which addresses the need for improved fuel economy and emissions reduction by eliminating the parasitic losses associated with mechanical vacuum pumps, as well as through weight reduction. Dayco’s patented high-performing venturi aspirator and flow control valve use the engine’s incoming airflow to generate the needed vacuum for brake assist creating a low and consistent brake pedal feel, even at altitude. “The system is a win for everyone”, said James Miller, Director of Dayco’s Valve & Actuator Technologies. “It ‘ticks the box’ in all major categories; lower cost, lighter weight, improved fuel economy, reduced emissions, and improved durability and performance”. Miller went on to say that “the collaborative development, design, and manufacturing efforts by Ford, Dayco, MacLean-Fogg, DowDupont and other suppliers throughout the supply chain, made this all new system possible”. Dayco’s ACTIVAC™ vacuum generation system, is not restricted to brake assist, as it can be utilized with other systems that requires vacuum, such as fuel vapor purge and crankcase ventilation. It demonstrates the level of technical innovation, design competence and manufacturing ability that is inherent within the organization, which contributes to Dayco being a world leader in automotive system solutions.